This cheesy baked pasta takes the components of lasagna and makes it into an easier and simpler dish. I could eat lasagna everyday and probably never tire of it. Thanks to Garfield, I learned about the delicious, cheesy, and satisfying dish that is lasagna. He also taught me to love pizza, hate Mondays, and take frequent naps. However, Garfield failed to mention how much work is involved in making lasagna from scratch. For the most part, lasagna is too time consuming for something that I would quickly inhale and devour. 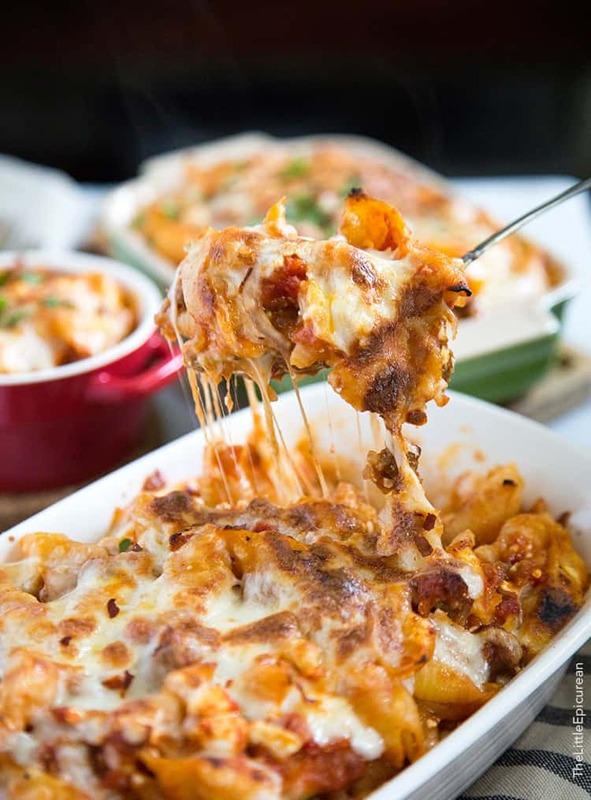 That’s why I must introduce you to the lazy man’s lasagna- cheesy baked pasta! It takes the components of lasagna and whips it into an easier and simpler dish! I made the meat sauce using Italian sausage, but you also use ground beef or pork. While you could use any kind of pasta you’d like- ziti, macaroni, rigatoni, etc. — I chose to use these medium shells. I find them perfect because little bits of sausage and sauce get trapped inside the shells. Want to know the secret to ooey gooey cheesy baked pasta? They make their baked ziti using small cubes of mozzarella. The cheese melts slowly and leaves little pockets of cheesy surprises everywhere. As a result, you’ll get that stringy cheese each time you spoon out a serving. Also, in place of ricotta cheese, I swapped in cottage cheese. 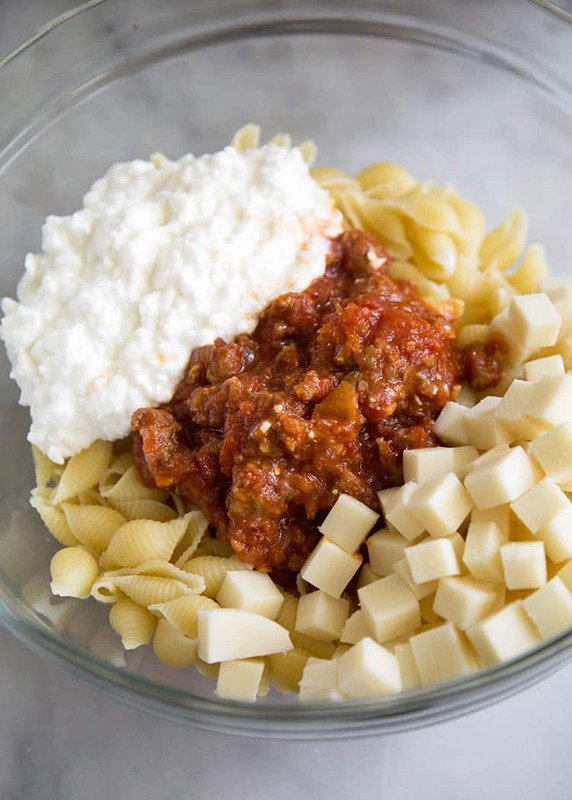 Ricotta cheese tends to dry out in oven, leaving the your pasta sauce a bit grainy. The small curds of cottage cheese remains silky and soft during baking. 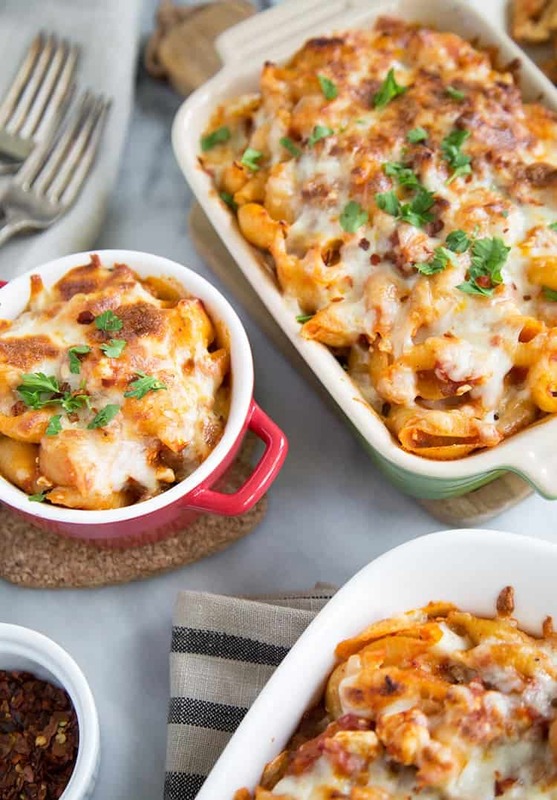 This cheesy baked pasta is a great make-ahead meal. Plus, it’s easy to double or triple the recipe to feed a crowd. Once you’ve tossed together the cooked pasta, meat sauce, and cheeses, spread it out onto a casserole dish or any oven safe serving ware. I like to divide the pasta among several small dishes for portion control. Cheesy pasta in meat sauce in not safe around me. This cheesy baked pasta takes the components of lasagna and makes it into an easier and simpler dish! This is a great make ahead dish that can be doubled or tripled to feed a crowd. Cook pasta to al dente according to pasta package instructions. Drain and let cool. Heat about 2 tsp of olive oil in a medium pot over medium heat. Add garlic and shallots and cook until shallots have started to soften. Stir often to prevent garlic from burning. Add Italian sausage and cook until browned. As sausage cooks, break into small pieces. Once sausage is cooked, drain off any excess fat/oil. Add entire can of crushed tomatoes, including any juice. Add tomato paste, sugar, salt, pepper, and red pepper flakes. Stir to combine. Bring to a boil and then reduce to a simmer. Let simmer for 10-15 minutes. Sample sauce and add additional salt or pepper to taste. Let sauce cool for about 15 minutes. 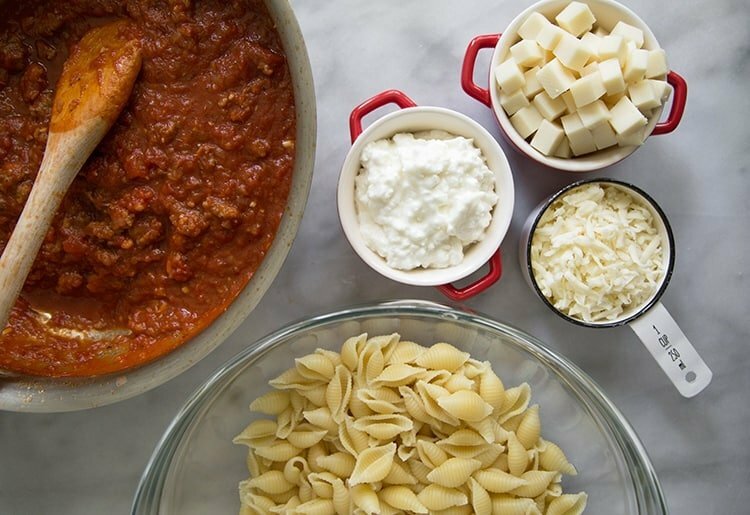 Preheat oven to 350 degrees F. In a large bowl, add cooled pasta, cooled meat sauce, cottage cheese and mozzarella cubes. Toss to combine. Place tossed pasta in casserole dish, or any oven-safe serving ware. Sprinkle shredded mozzarella cheese on top. Bake for 20 minutes until cheese on top is melted. Set oven to broiler and allow cheese to brown for 30-45 seconds. Remove from oven and let dish stand for 5-8 minutes before serving. TO FREEZE: assemble pasta and cheese in a freezer safe container. Cover tightly with plastic wrap store in the freezer for up to one month. Bake as directed. I love how cheesy this pasta is! It’s perfect for a simple dinner option. Pasta is my BFF! I couldn’t pin this fast enough. This is perfect for game days! Yes! I’ll have to make this again for the Super Bowl! really delicious, I like pasta to!!!!!!! Baked casseroles are one of my favorite things, always so delicious and easy! Can’t wait to try this, pinned this recipe! Wow Maryanne! This pasta looks amazing! I agree – lasagna is time consuming (who has time for that??). 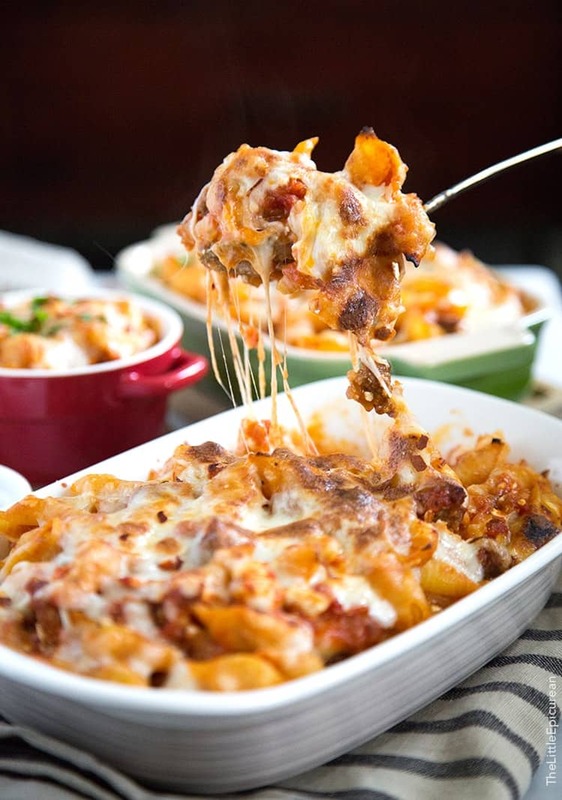 Baked pasta is the way to go! Pinned! Oh my goodness…this looks SO good! Love that hint about the cubes of mozzarella. I’ll take as many cheesy bites of goodness as I can get :) pinned! 1. I LOVE that main photo, Maryanne! 2. I basically made almost the EXACT same dish this week. I used macaroni, but I made a meaty red sauce, and layered it with fresh mozzarella and cottage cheese. Are we twins??? We doubled the batch and, at first, we thought we made too much. We were definitely wrong though because the pasta didn’t even make it to the second night. It was delicious!!! Thank you for this great recipe! Wow! 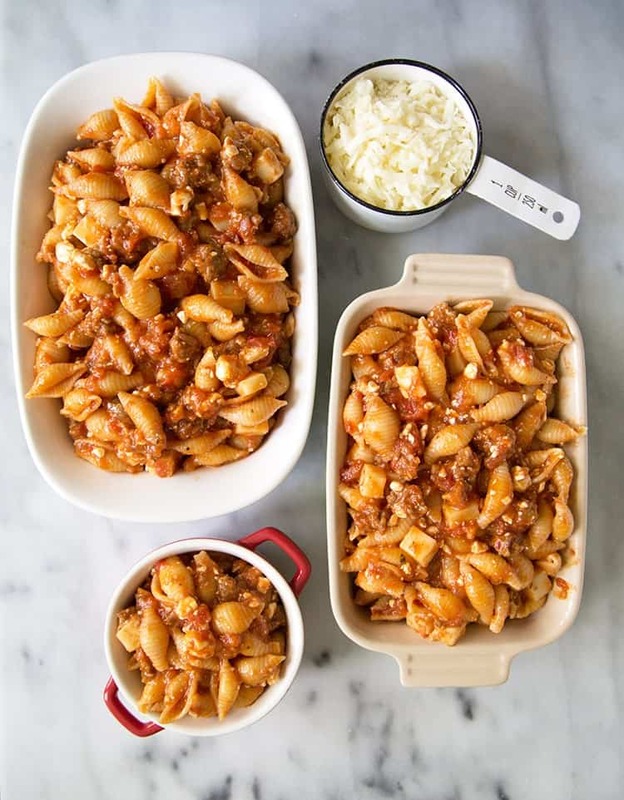 My wife and I have always had so much left over from our spaghetti dinner that this recipe is perfect for using the left over to make a casserole and freeze for latter.